Tench Class Submarine: Laid down, 7 June 1944, at Portsmouth Navy Yard, Kittery, ME. 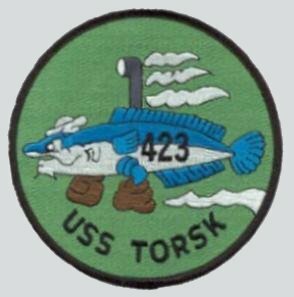 ; Launched, 6 September 1944; Commissioned USS Torsk (SS-423), 16 December 1944; Snorkel conversion completed in 1952; Decommissioned, 4 March 1968; Placed in service as a Naval Reserve Training vessel at the Washington Navy Yard,; Redesignated Auxiliary Submarine (AGSS-423) in May 1968; Reclassified Miscellaneous Submarine (IXSS-423) in June 1971; Placed out of service and simultaneously struck for the Naval Register, 15 December 1971; Final Disposition, turned over to the state of Maryland to be used as a museum in the Inner Harbor at Baltimore, 26 September 1972. 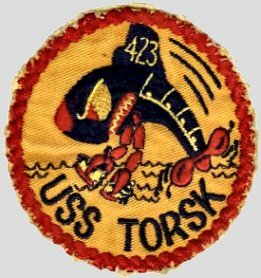 Torsk received two battle stars for World War II service. 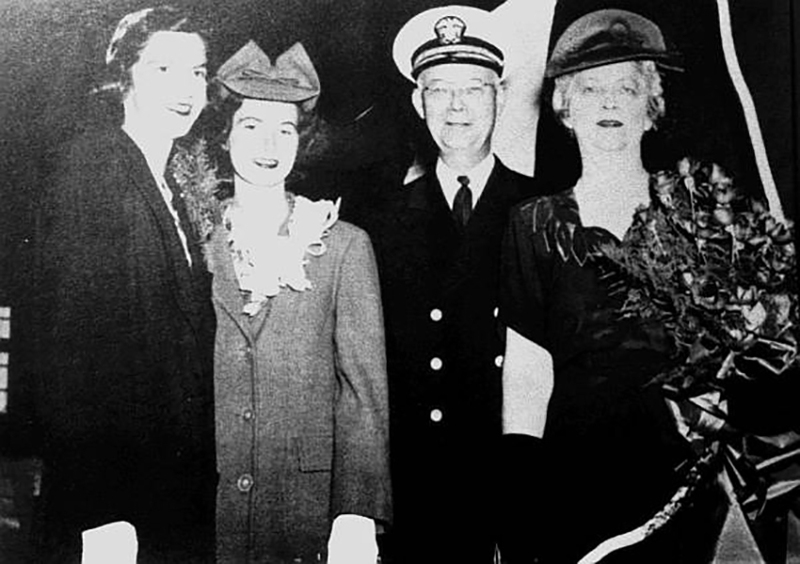 223k Rear Admiral Thomas Withers, USN, Commandant of the Portsmouth Navy Yard stands with Mrs Allen B. Reed (on the right in the photo), Torsk's (SS-423) sponsor, and Mrs Reed's daughters Mrs. Lane C. Kaley and Miss Katherine Reed who acted as her assistants. Admiral Withers presented a bouquet of roses to Mrs Reed and corsages to each of the daughters. USN photo & text courtesy of usstorsk.org. 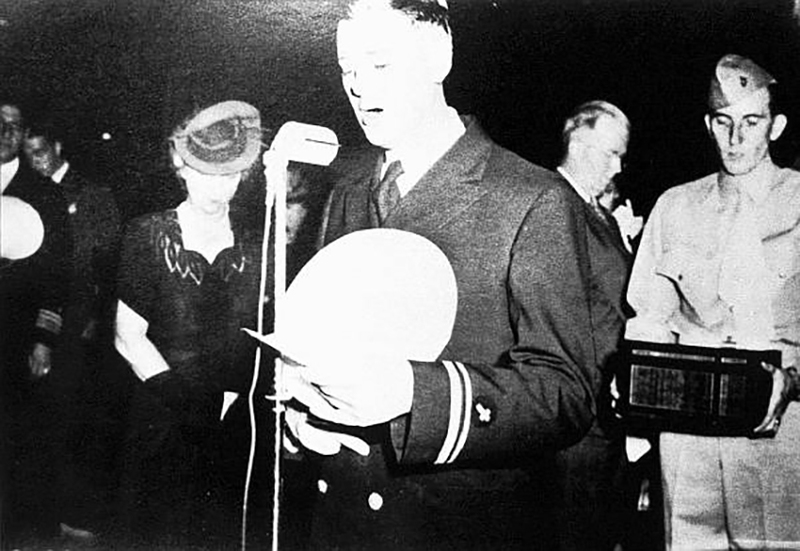 243k LT (JG) Paul P. Galliger, USNR, Navy Yard Chaplain, offers a prayer before Torsk (SS-423) is launched. USN photo & text courtesy of usstorsk.org. 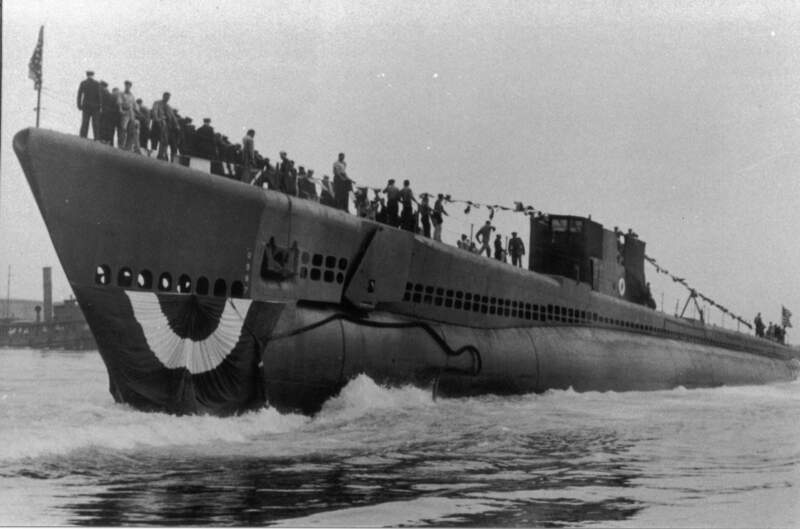 243k Mrs Allen B. Reed christens Torsk (SS-423). USN photo & text courtesy of usstorsk.org. 589k The Torsk (SS-423) slides into the Piscataqua River during her launching at Portsmouth Navy Yard, Kittery, ME., 6 September 1944. USN photo courtesy of Scott Koen & ussnewyork.com. 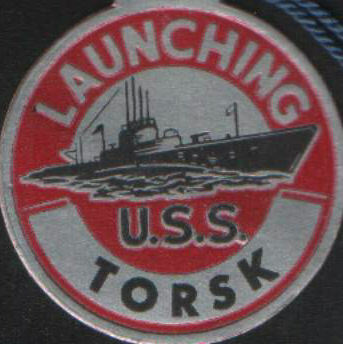 28k Commemorative launch day badge from Torsk's (SS-423) launching at Portsmouth Navy Yard, Kittery, ME., 6 September 1944. Courtesy of James A Munroe in remembrance of his father Raymond L. Munroe Sr. who worked at the yard during WW II and the Korean wars as a chauffeur. 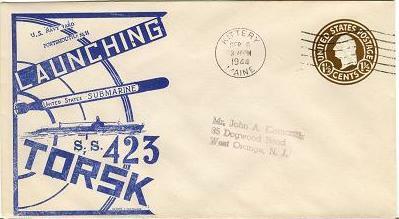 19k Commemorative post mark on the occasion of Torsk's (SS-423) launching at Portsmouth Navy Yard, Kittery, ME., 6 September 1944. Courtesy of Jack Treutle (of blessed memory). 83k Torsk (SS-423) in Portsmouth Harbor, New Hampshire, January 1945. 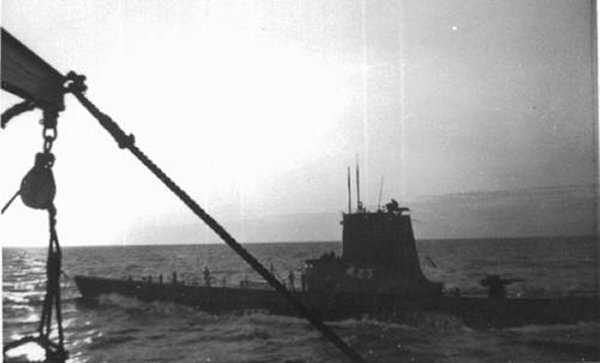 Courtesy of Erminio Bagnasco's book, "Submarines of WW II", submitted by Aryeh Wetherhorn. 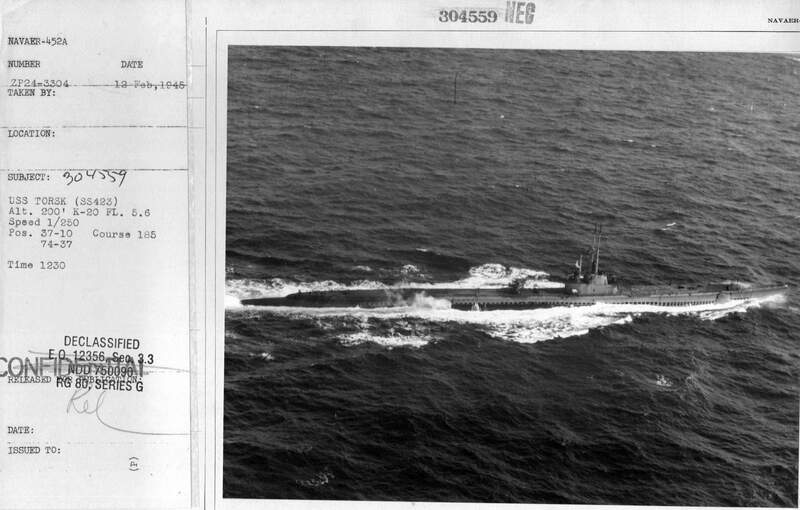 830k Two hundred feet above the Torsk (SS-423) on 12 February 1945 en route from New England to Florida. USN photo # 80-G-304559 & 80-G-304560 from NARA, College Park, Maryland, courtesy of Sean Hert. 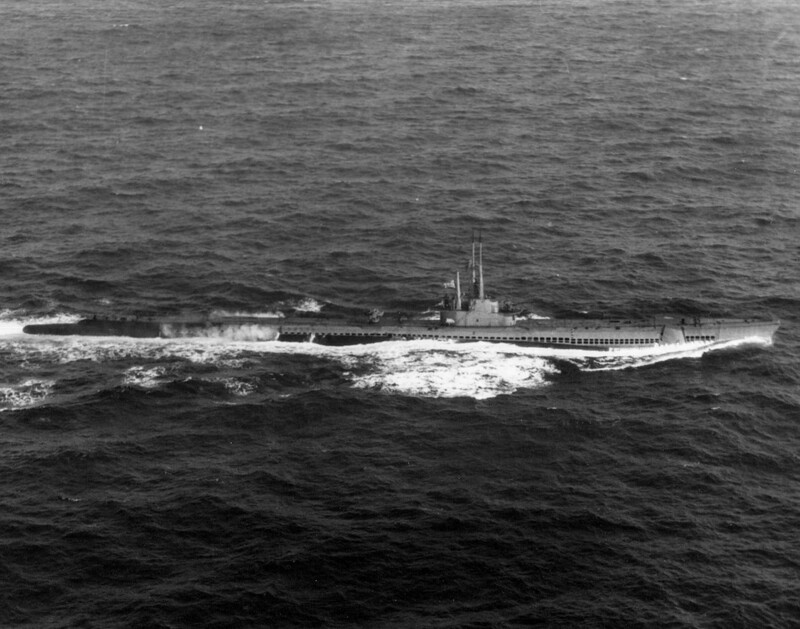 2.58k Four photo PDF of Torsk (SS-423) underway off the U.S. east coast, en route from New England to Florida, 16 February 1945. Photographed from a NAS Richmond, FL. aircraft. USN photos # 80-G-313788, 789, 790,791 from NARA, College Park, Maryland, courtesy of Sean Hert. 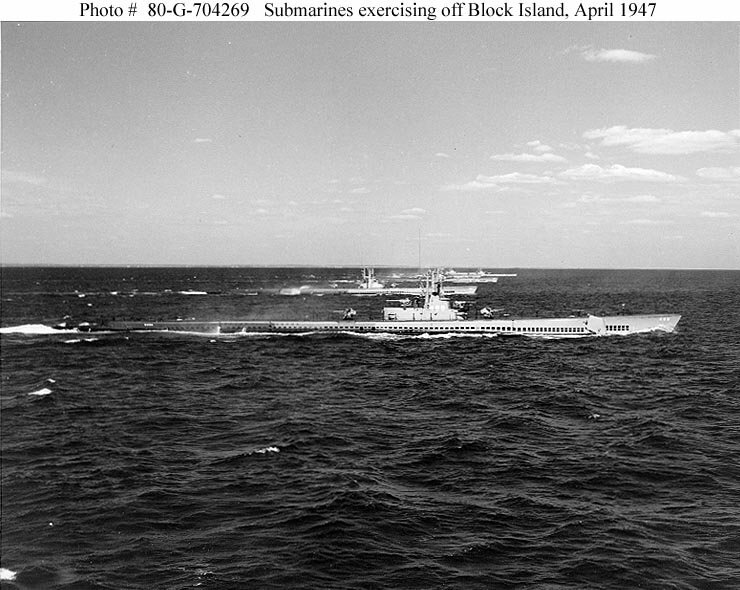 99k Torsk (SS-423), maneuvering in line abreast formation during exercises off Block Island, Rhode Island, in April 1947. 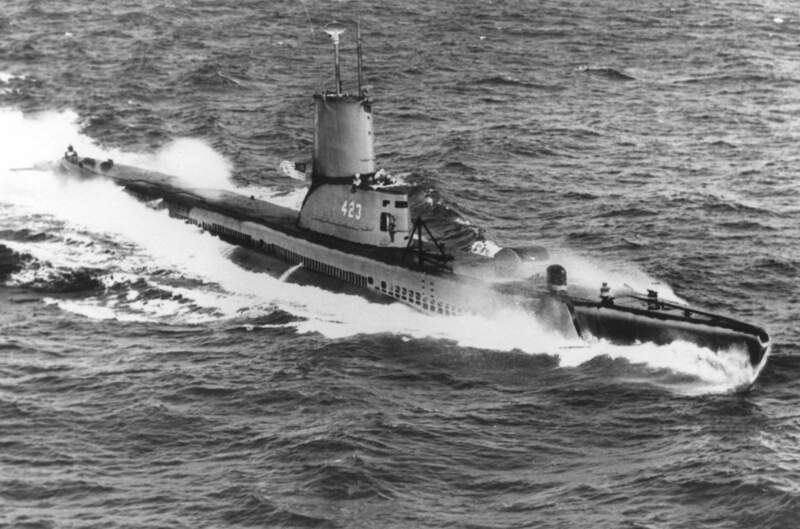 Nearest submarine is Sarda (SS-488). Torsk is next. 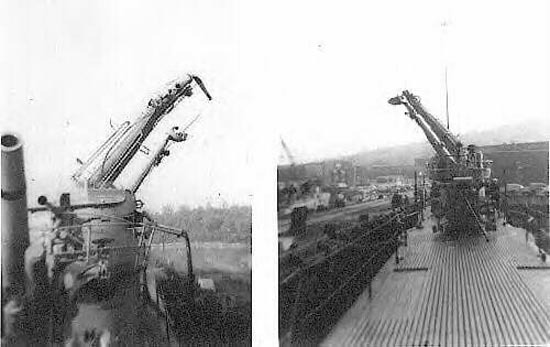 Both are fitted with 5"/25 deck guns fore and aft. US National Archives photo # 80-G-704269,from the collections of the US Naval Historical Center. 387k Med cruise summer in 1950 Naples Harbor: Sea Leopard (SS-483), Torsk (SS-423), and Sea Robin (SS-407). Photo courtesy of John Hummel, USN (Retired). 2.20k The destroyer tender Yellowstone (AD-27) at Augusta Bay, Sicily, May - October 1950. Ships alongside to starboard; Sea Robin (SS-407), Torsk (SS-423), Sea Leopard (SS-483), Burrfish (SS-312). To port; John R Pierce (DD-753), Barton (DD-722), Shea (DM-30), and in the background Bauer (DM-26). US National Archives photo # 80-G-428712, from NARA, College Park, Maryland, courtesy of Sean Hert. 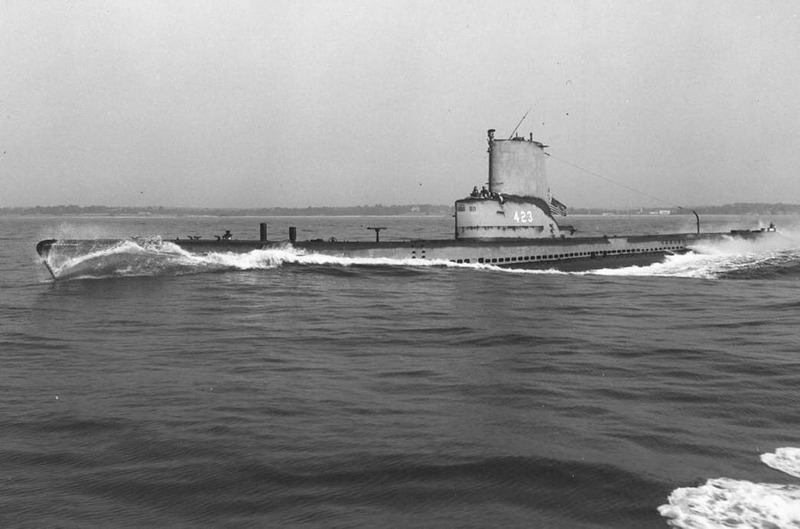 96k Torsk (SS-423), underway in May 1952, shortly after her "fleet snorkel" conversion. She is still fitted with a 5"/25 deck gun, aft of her sail. 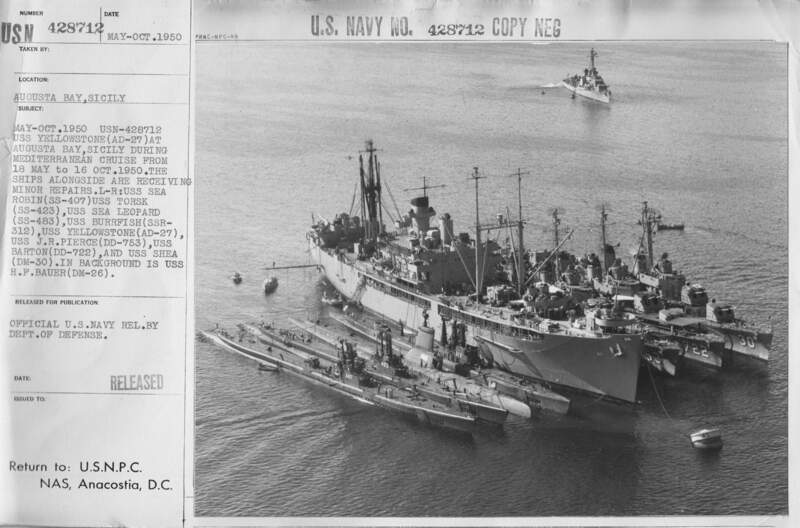 USN photo # USN 1079481, from the collections of the US Naval Historical Center. 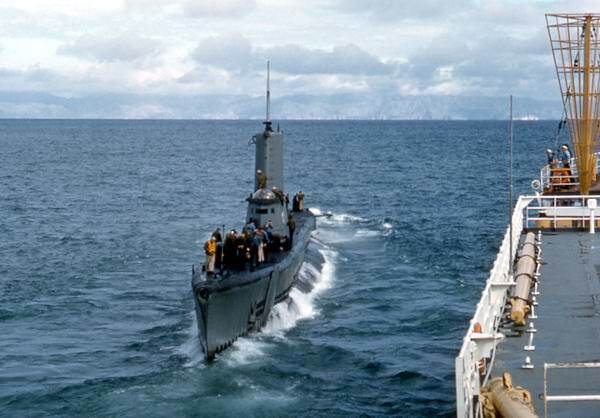 13k Torsk (SS-423) coming alongside the New (DD-818) which became the first US navy destroyer to refuel a sub underway, 1953. Photo by Tom Nau, courtesy of Rick Palmer. 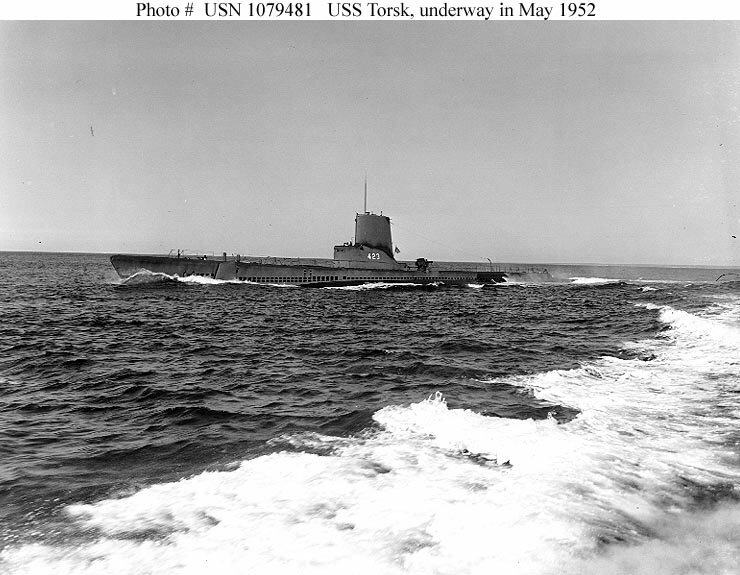 117k Torsk (SS-423) underway 30 July 1954. US National Archives photo # 80-G-669954, from the collections of the US Naval Historical Center. 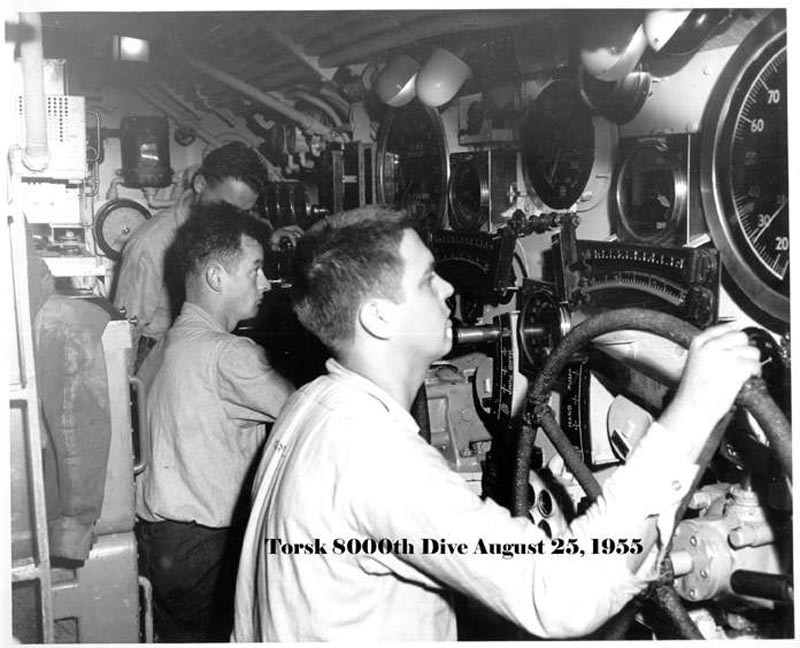 107k 8000th dive of the Torsk (SS-423) on 25 August 1955. USN photo courtesy of Scott Koen & ussnewyork.com. 265k View of the Torsk's (SS-423) periscope after a collision with the destroyer Johnston (DD-821). USN photo courtesy of Scott Koen & ussnewyork.com. 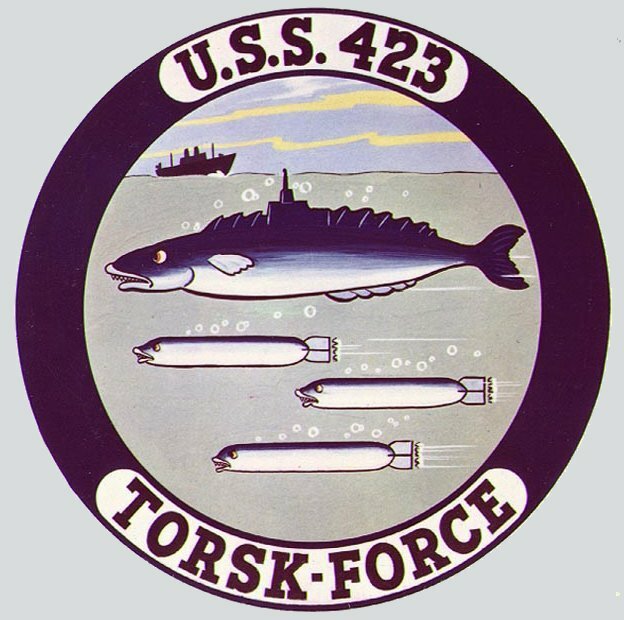 267k Torsk (SS-423) shows the flag in 1958. USN photo courtesy of Scott Koen & ussnewyork.com. 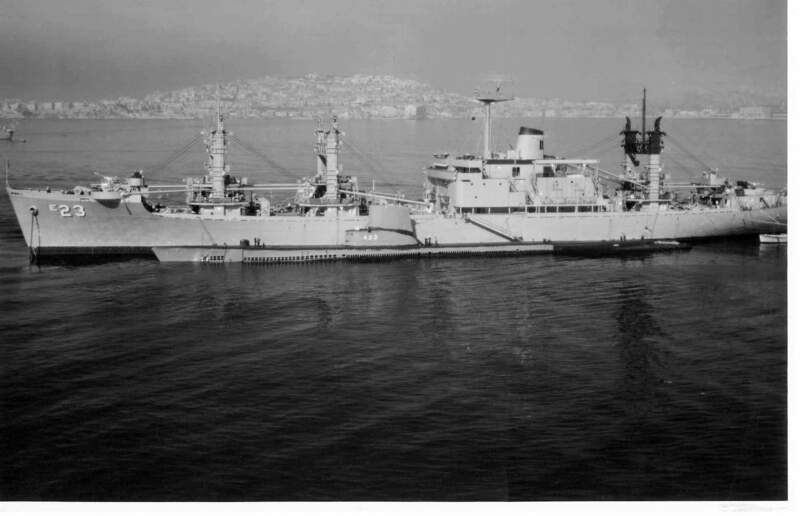 1.40k Nitro (AE-23) at anchor in the Mediterranean Sea with Torsk (SS-423) alongside, in 1960. USN photo courtesy of Richard Miller, BMCS USNR, Ret. via Gary Priolo. 41k The Torsk (SS-423) coming alongside USCGC Courier in 1960. Photo by LT. Robert Haldi & submitted by John Hummel, USN (Retired). 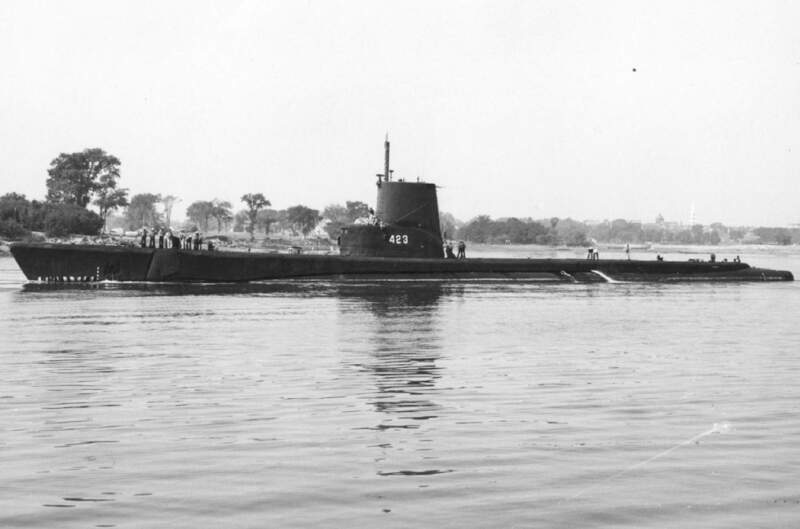 204k Torsk (SS-423), departing Portsmouth Naval Shipyard, Kittery, ME., 16 August 1965. 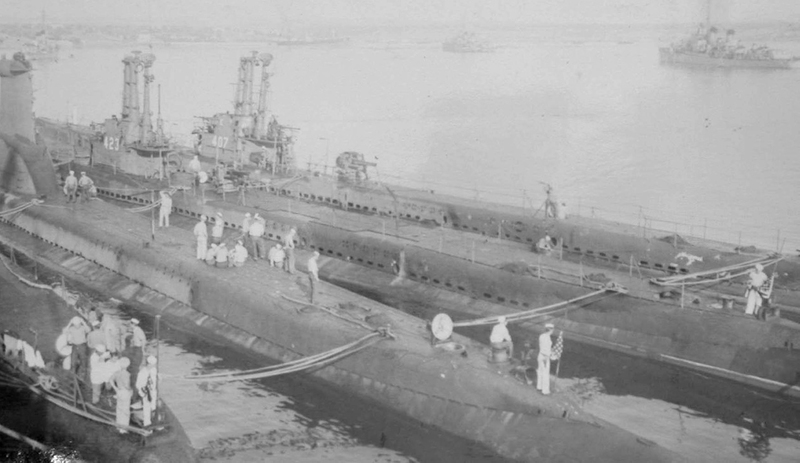 USN photo # USN 1112857, from the collections of the US Naval Historical Center. 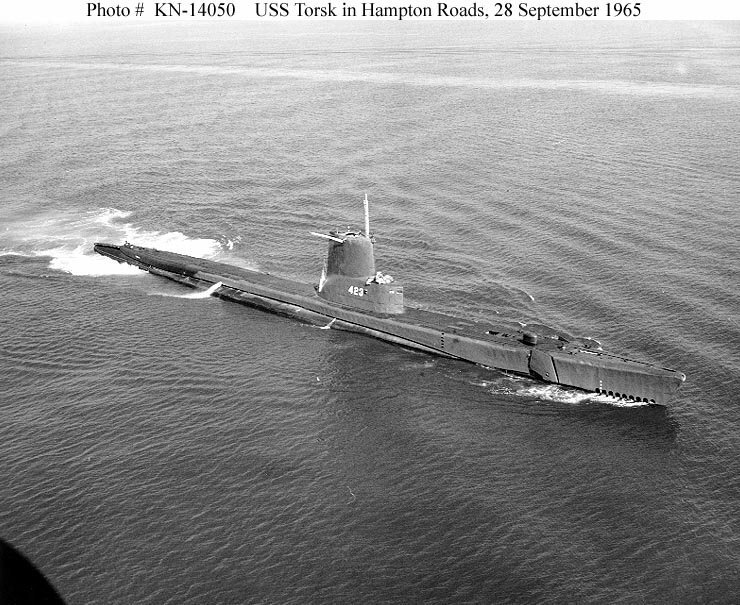 134k Torsk (SS-423) in Hampton Roads, 28 September 1965. USN photo # KN 14050, from the collections of the US Naval Historical Center. 652k Guess who? Torsk (SS-423) when she was the Reserve boat at Washington Navy Yard, Washington D.C., sometime in the late 1960's. Photo courtesy of Charles Thompson. 616k Torsk (SS-423) when she was the Reserve boat at Washington Navy Yard, Washington D.C., sometime in the late 1960's. Photo courtesy of Charles Thompson. 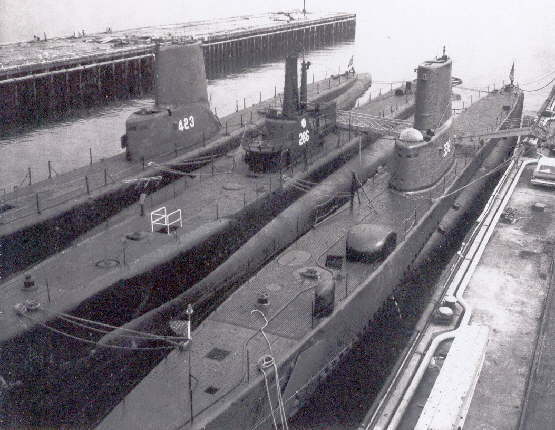 42k Torsk (SS-423), Billfish (SS-286) & Carp (SS-338) moored together in Spring/Early Summer of 1968 @ Boston Navy Yard after Torsk's Decommisioning and before she was towed to Washington D.C. for use as a Reserve Trainer. Billfish or Carp was the training boat in Boston at the time. Photo i.d. courtesy of Larry Derouin. 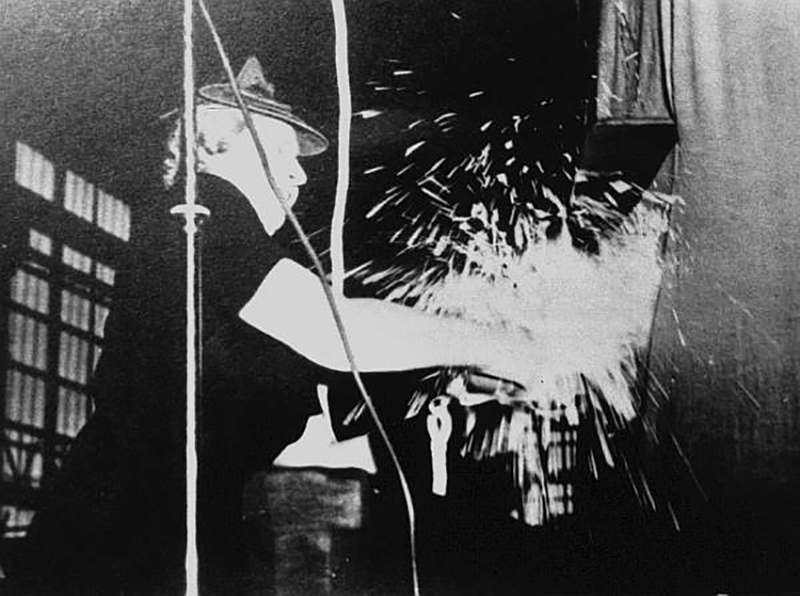 220k Press release of Torsk's (SS-423) departure from the DC Navy Yard, 8 February 1972. Photo courtesy of Charles Weaver EM2 via Tommy Trampp. 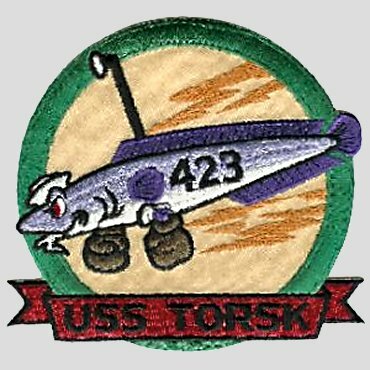 47k Torsk (SS-423), ship's control panel. Photo courtesy of John Hummel, USN (Retired). 154k Series of photos of this link of the Torsk (SS-423) moored in Baltimore Harbor, 2009. Photo courtesy of Dave Grayson via Frank Smith TM1 (SS)& John Hummel of Redfin (SS-272) fame. 75k Torsk (SS-423) radio room: Black unit left side full frontal is RBS receiver next to it is Patch panel; Large silver unit on right is URC-32 Transceiver (main hf transmitter). Photo courtesy of John Hummel, USN (Retired).